A dive in the sand for Palmer is not only a profitable venture, it’s also his passion. The sand is the only place he feels at home. However, after being commissioned by a band of mysterious rebels, a lucrative dive job may end up being his last and a secret is uncovered that can threaten all he knows. Sand is a far future tale of an earth that has been buried. The sand dunes form the landscape and the scraps of a previous civilization form the major currency. The world Howey has created is completely satisfying as a setting for a gripping story filled with mysteries, conspiracies and danger. One of the aspects I enjoyed is that there was no attempt to explain why our previous world has been buried in sand. We are stockpiling post-apocalyptic lectures on the kind of future to which our present may lead us, so it’s refreshing to bypass the lesson for a change and focus on the setting. The adaptation to a world of sand brings Frank Herbert’s Arrakis to mind with a focus on civilisation rather than religion and prophecy. I also sensed a hint of the Dust Bowl era, with its poverty and pervasive grit. I found it clever to introduce several new terms for sand in its various manifestations; for example: scoop – sand that collects in boots, matte – sand that collects in hair. The ever-present sand promotes an entirely new vocabulary. However, the most impressive evolution in this sabulous environment is that of the sand diver. The mind-controlled technology behind the diving is only loosely explained which allows the reader to focus on transplanting a sub-aquatic experience to a subterranean context without getting bogged down in the technical details or possible implausibilities thereof. The plot is told from the point of view of three siblings within the same family. Palmer, the second-oldest kicks off the story by making a discovery from the past world which creates a threat to the current world. Conner, the younger brother makes a discovery from their family’s past that helps to uncover that threat. And Vic, the oldest sister, processes both discoveries to fight the danger facing them all. That is, in essence, the story structure. Unfortunately, in the construction of the plot there are a few implausibilities that rankle. A yearly camping trip allows the only real opening for a message to arrive from the family’s past and it feels both overly convenient and highly implausible. The motivation behind the threat posed to the cities of Low-Pub and Springston isn’t terribly logical and the nod to David Lynch’s movie Dune in the last scene of the book is downright silly. However, at the same time, the story remained exciting and totally worth the effort. Of the three main characters, Vic and Conner are probably the most well-drawn. Conner has to give up a future as a sand diver in order to raise the youngest sibling Rob and plans to abandon Springston to journey to the east – from which no one has previously returned. The conflict between his need to escape and his ties to Springston along with his development throughout the story make him interesting reading. The reader also gets a strong feel about the connections within the family through Conner giving his character a very important role in how the reader responds to all family members. Vic is a resilient and tough sand diver with more than one chip on her shoulder. Her past has its share of darker experiences and this plays out quite logically in her current status. She dates the leader of a rebel group taking risks for glory. She is separate from her siblings and, in particular, her mother – a well known brothel owner in Springston. Her deep sand dives are a form of self-validation where none was received from her father, an almost mythical figure in the story. The writing itself is exactly what I would expect from Howey after reading the magnificent Wool trilogy. He transitions smoothly between acclimatising the reader to a new environment and delivering a dramatic story. Revelations surface gradually with prose that is well-chosen and, thankfully, error free. 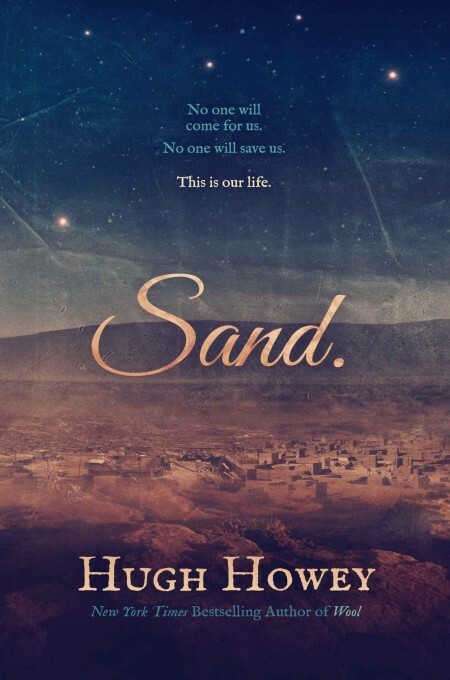 I’ve written before about Howey that his writing gets out of the reader’s way, so that focus remains on the story and characters and Sand seems to follow this philosophy. I would highly recommend this novel. The sand diving alone makes it worth the price, even if I have some issues with the plot. It does not look like this novel is going to form a trilogy or series, so for those who don’t like committing to multiple volumes, this makes a great “dive” into an imaginative and worthwhile reading experience. This entry was posted in 4.5, Novel, Science Fiction and tagged Post-apocalyptic, Science Fiction, Thriller. Bookmark the permalink.